DOGABUNGA!!! It’s the 2nd Annual Hang 20 Surf Dog Classic! Here in Jupiter, we love our beaches. We love our surf bums. And we love our dogs. When you combine those three loves together, you get the Hang 20 Surf Dog Classic, a fundraiser for our local, no-kill animal shelter and clinic, Furry Friends. On Saturday, August 27, 2016, shredding canines from across Florida came to Jupiter to compete for the top title in their weight group as our community came together to support animals in need of homes. It was a day of fun for dog lovers of all ages with food, live music, a dog agility show, vendors, and activities for the kiddies. And, of course, lots of surfing pups. Waldo, champion Surf Dogger and proof that real men wear pink. What a cool dude! Waldo was rescued by JUP Mama’s friends, Susie and Mike Leverette, from Palm Beach County Animal Care and Control when he was four months old. Since then, he has impressed the state of Florida with his skills on a surf board. Now, at the ripe old age of seven, Waldo competes two times per year at both the Hang 20 Surf Dog Classic and the Cocoa Beach Easter Surf Festival. Want to know how Waldo learned to surf? Check out my post from last year’s competition here. Susie and JUP Mama, Jupiter High School classmates and former teenage lifeguard groupies. This was my first time bringing my “big girl” camera (my Canon EOS Rebel T5) to a sporting event to take blog photos and I had quite the time trying to get my lens to un-fog when we got to the beach. Apparently, car air conditioning and beach humidity don’t mix. Once I was back in action, I managed to get some photos of the small dog surf heat. Boy, is it impressive to watch these tiny dogs catch some waves! This miniature poodle was really rocking out there! Sometimes, the dogs need a little help, so they tandem surf with a human on the back of their board for direction and steering… and to keep them from falling off. There were plenty of dogs watching the show from the beach. This guy was having a blast in the surf. Once the little dogs were done, it was time for the medium dog surf heat. Look at this golden retriever, all suited up in his life jacket! 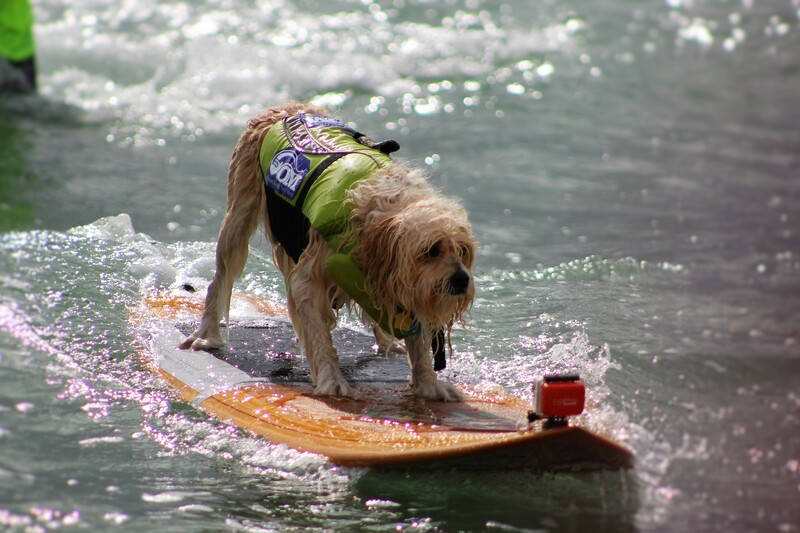 Waldo is a pretty special surf dog because he is able to ride his board without the help of a human. His owner, Mike, helps him paddle out, turn his custom 7-foot mahogany and cypress board around, and give him a gentle push back to shore. Mike checking out the waves for Waldo. Waldo takes a quick look back at his fans on the beach. Waldo even impresses the life guard with his skills! No lives needed saving on Saturday, neither dogs or nor humans. Thumbs up for Waldo, headed to the shore! Waldo was one of the few dogs on Saturday to ride his board by himself all the way to the beach. Hugs from adoring fans. It’s tough being a celebrity. Seriously, I am jealous of Waldo’s hair. Look at those nice blonde beach waves. If only I was a Tibetan Terrier. Waldo showing off his first place trophy for the medium-size dog group. If you’re ever having a bad day and need some cheering up, I highly recommend watching this video of Waldo captured by the GoPro attached to his surf board. It is certain to make you smile. I couldn’t pass up taking a picture of this classic Volkswagon parked in front of me at Carlin Park. Thanks Suvi! Yes, it seems to be a thing here in the USA, particularly California, that dogs compete surfing. If you ever wanted to look up other surfing dogs, there is Abbie Surfs (who holds the Guinness World Record) and Faith, a surfing pitbull! Thanks for the comment and I will definitely wander over to The Sarasota Salt!